Light, sandy soil best, but can adapt to any fertile, well drained soil. Mix a good organic compost into the soil before planting. Plant 'slips' that grow from sprouting tubers in late spring or early summer, after the soil is very warm. 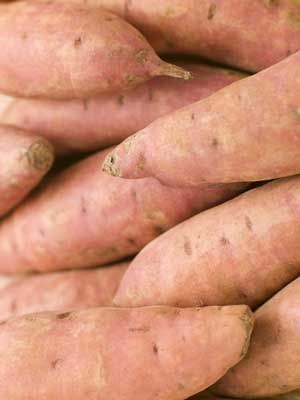 Sweet potatoes form a dense green ground cover, thriving in hot summer conditions. Tubers are often found 12 inches or more from the plant's primary crown, so dig carefully. Dig in autumn when the soil is still warm. Cure in a warm, airy place for two weeks before storing at cool room temperatures. Deer are fond of sweet potato vines.